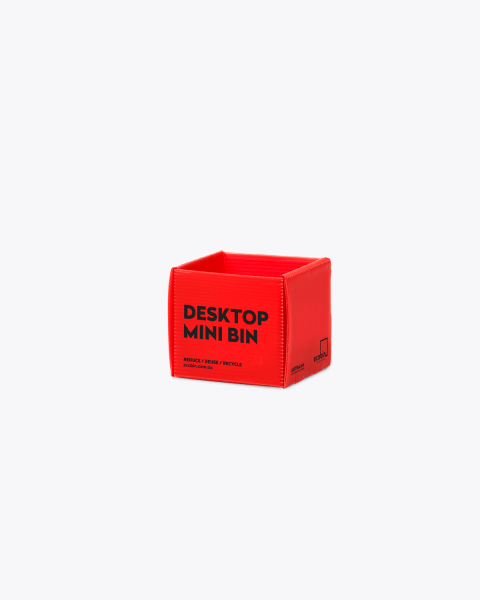 The Indoor Red Landfill waste bin is an environmentally friendly replacement for your all-purpose office waste bins. Separating your landfill waste before it goes into your bin can prevent unnecessary materials going to landfill such as plastics, that can be recycled and food waste. A lot of materials that end up as waste contain toxic substances. These toxins then leach into our soil and groundwater, and become environmental hazards for years. It is hard to find suitable locations to put landfills and at the current rate of waste disposal, we could soon run out of space all together. Landfills also produce a toxic liquid called leachate that is a mixture of organic acids, dissolved chemicals and rainwater which can unfortunately contaminate our surrounding land and waterways, creating a threat to marine life. Every year over 6 million tonnes of rubbish are dumped into the world’s oceans. 80% of this waste is plastic and has led to an estimated 46,000 pieces of plastic for every square mile of ocean and is responsible for killing more than a million seabirds and 100,000 mammals every year. HOW DOES THE INDOOR WASTE LANDFILL BIN WORK? Did you know that if you throw your daily newspaper in your bin and send it to landfill that it will cause 350 kilograms of extra carbon dioxide each year? Our aim is to send as little waste as possible to Landfill, but unfortunately not every piece of material or waste can be recycled, which is why we still have the need for the landfill bins. 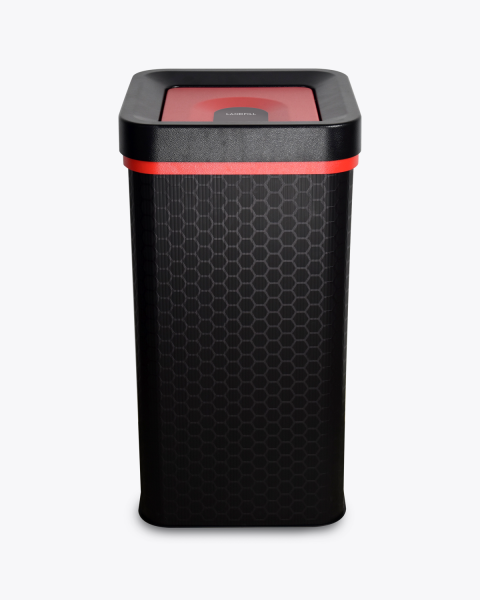 The Indoor Waste Landfill bin is the ideal bin for offices, schools, colleges and public indoor spaces. The bin is basically for all materials and waste that cannot be recycled and must be sent to landfill. Made from a tough, yet lightweight corrugated plastic, the indoor waste landfill bin is extremely durable. 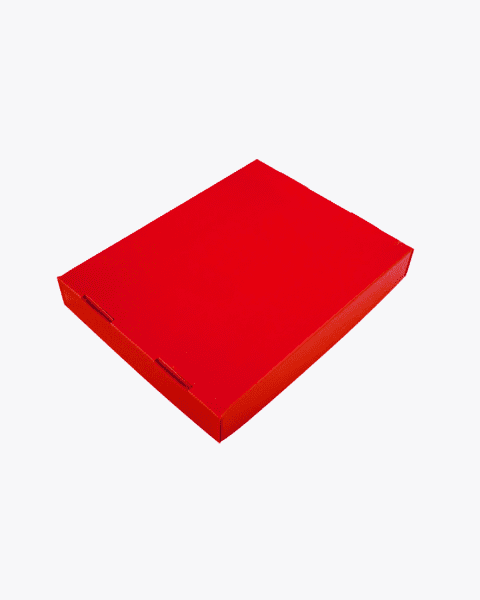 It is also tear proof, resistant to spills and liquid and can be washed with a damp cloth. 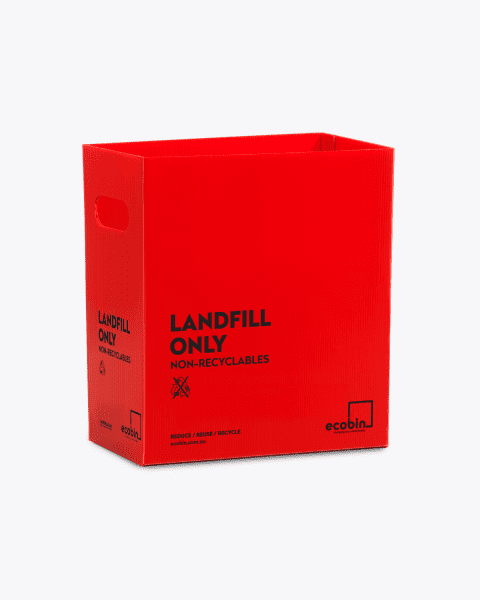 The bin is clearly marked “Landfill” and colour coded red, the standard colour for the landfill waste stream, this helps to prevent accidental misplacement of rubbish and mistakes with waste stream management. 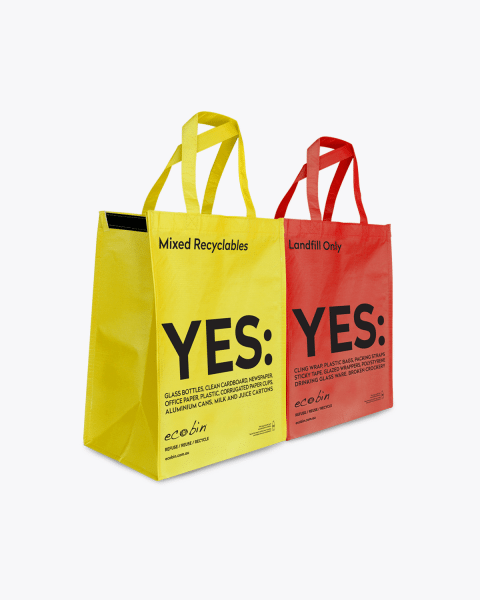 There is often confusion over what kind of plastic goes into which bin, so it’s a good idea to get a poster or flyer to place above your bin to educate your office as to what material belongs where. We have a great range of educational posters in the “Accessories” section of our website. Whilst we wish that all materials were recyclable, we understand that some items are still required to be sent to landfill and require a specific bin. 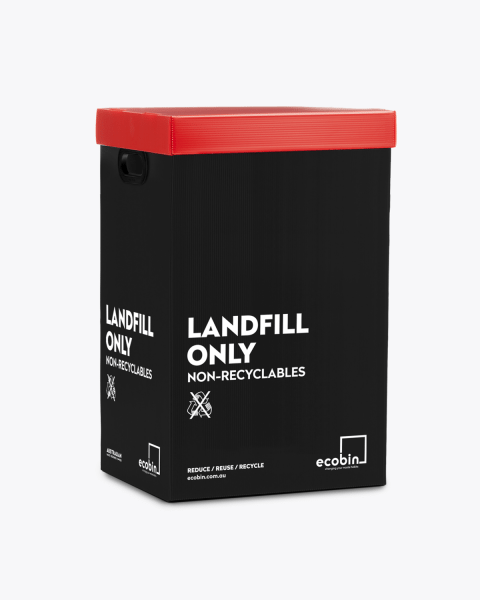 If your organisation is environmentally conscious, you’ll find no better choice than Ecobin for all your waste disposal and recycling needs. WHAT CAN I PUT IN THE INDOOR WASTE LANDFILL BIN? Think of your indoor waste landfill bin as your last resort bin. This bin should only be used if what you are throwing out cannot be recycled. Hopefully, after you’ve recycled your bottles and composted your food waste there isn’t a lot to go in there. 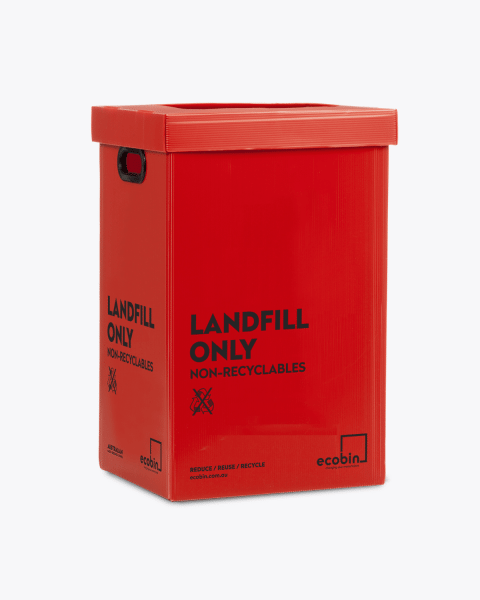 Ecobin’s Indoor Landfill bins are made of corrugated plastic that is a certified carbon neutral product. 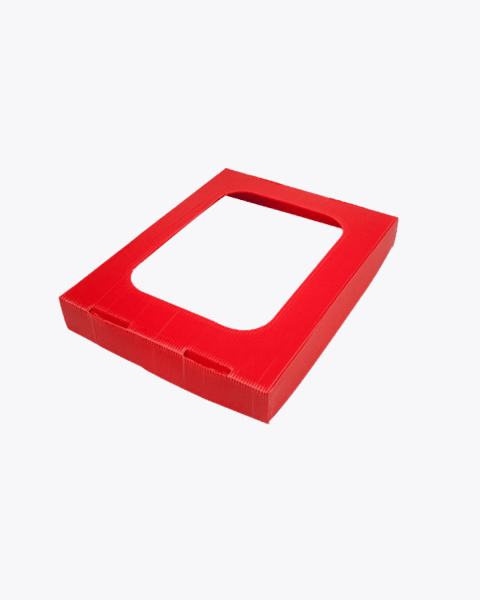 The recycling indoor bins require substantially less energy to manufacture than injection moulded plastic bins and or metal bins, which is why these bins are a great alternative. Ecobins are tough and designed for reuse, but even good things come to an end. Conscious of the impact our products have on the Earth during every stage of their life, we’ve made your Ecobin bin fully recyclable. At the end of its hard life, just pop the bin in your recycling bin for collection.